An important concept within Hinduism is that of avatar – meaning literally, "one who descends." The closest English word is "incarnation." This is technically incorrect since many Hindu sects (especially Vaishnavas) believe that God does not adopt a material (carnal) body, but appears in spiritual form. Another important notion is that God, or a specific deity, can expand and multiply him or herself into unlimited divine forms. In other words there may be different forms of a deity even if they are not avatars. 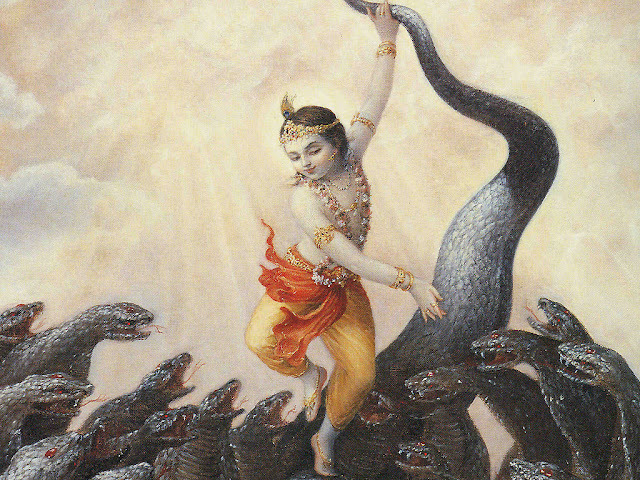 Vishnu is most famous for his many avatars of which ten, the Dashavatara, are principal. Of these, Krishna and Rama are the two most popular focuses in the UK today. Avatars feature less prominently in Shaivism. Nonetheless, Shiva has several important forms, such as Nataraj (the Lord of Dance) and the Rudras, representing his angry and frightful aspects. 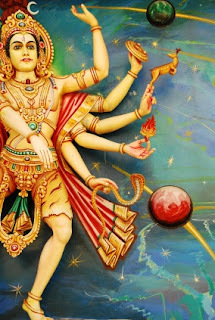 Shakti, the consort of Shiva, has many forms and incarnations: some are kind and loving, such as Parvati, and others warlike and fearful, such as Durga and Kali. a particular form or expansion. a particular activity performed by that deity. a quality or feature of that deity. In this list, Narayana is a form of Vishnu in the spiritual realm. Krishna and Rama are also Vishnu forms, often considered his avatars. Govinda is a name of Krishna meaning "one who gives pleasure to the cows." Mahadeva and Mahesh are epithets of Shiva. Rudra is a particularly angry form (or expansion). Nataraja (the King of Dancers) is a name of Shiva. Shakti is quite a technical name for "the Goddess." She is most often called Devi and affectionately called "Mataji" (respected mother). Parvati, Durga, and Kali (shown here) are distinct forms of Shakti.